It's not bad, really. Jerome is both funny and thoughtful, occasionally even poetic. 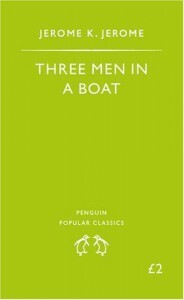 Three Men in a Boat was originally intended to be a travelogue of the Thames boating scene of the day, but the humor (excuse me, humour) overtook the bits of history and commentary on local life.The travelogue sections are still, occasionally, interspersed and are prettily informative. They made me want to go and see. However, these elements of the book are inconsistent. They pass through many sites and towns with little comment other than the antics of Jerome and his friends before remembering that he's supposed to be saying something about the venues.Also, the comic and the informative scenes are incongruous tones. Some more blending of Jerome's good humour into the depiction of village history and life would have been better than setting aside the sugar for a bit of multigrain.I'd say, read it for Jerome's wit, but at least skim the Baedeker bits.